The fourth installment of the fantasy strategy game series created and expanded by Dutch studio Triumph Software. Age of Wonders III takes place in a fantasy world in which various races and factions are fighting for power. 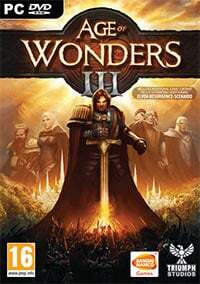 Age of Wonders III for PC is the fourth installment of a popular turn-based strategy game series by the Dutch studio, Triumph. The production process lasted for over three years. The developers were financially supported by one of the biggest fans of the series – Markus Persson, the creator of Minecraft. Age of Wonders III yet again takes the players to a fantasy world where different races and groups fight for dominance. The main campaign allows the players to pick a side of one of the two warring factions – the Empire of the Community, or the Court of the High Elves, created after the unification of dark and forest elves. Several popular characters from the series play an important role in the story, including Merlin. The gameplay of Age of Wonders III combines elements of strategy and role-playing games. The players explore a sizable maps, discover new locations, meet NPCs, and fight exciting battles. At the same time, they direct the development of their kingdom, including the transformation of the area and the climate to suit the needs of the nation chosen. The developers took care of the multitude of races and cultures which can be lead in the fantastic world. The gameplay in Age of Wonders III is aggressive and focused on the war. The only way to win a campaign is to defeat your opponents’ army and conquer their lands. Battles are played on three-dimensional maps covered with a grid of hexes. The developers prepared an extensive system of skirmishes which rewards a proper use of the terrain or attacking enemies from the flank. In addition to standard battles in the open field, there are also sieges and naval battles available. In contrast to earlier installments in the series, in Age of Wonders III on PC the developers decided to use an engine that generates three-dimensional graphic environment. It made adjusting the quality of visuals to modern standards in this type of productions possible. Game score 8.21 / 10 calculated out of 407 players' votes. Expectations before the premiere: 9.5 / 10 calculated out of 336 players' votes. This guide for the Age of Wonders III is a description of all of the most important elements of the game, as well as detailed hints concerning both campaigns and their endings.